I grew up with 2 brothers therefore I have always loved and needed my relationships with my girlfriends. To be honest I’m a tad envious of the sister bonds each of them share with their female siblings. Over the years, the times we get together are less frequents especially the four of us. 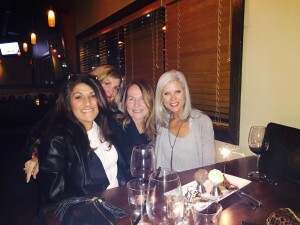 Last night we got together to celebrate Lynn’s Birthday. By celebrating Lynn, we also celebrate this friendship. Reflecting on the evening it puts a smile on your face, the conversation flows, the laughter is constant and depending on the topic there are tears shed of joy or sadness. I get that we are not unique but how lucky we are as women to have these friendships we reap so much in return. With my recent foray into the twitter world I say # sanity # love# support# fun regardless of whether it’s biased or unbiased…we are blessed to have these friendships. What is inspiring to see, the benefits of these friendships and the impact on our children. Children learn by example and giving them the opportunity to witness strong, positive, healthy friendships in our lives has encouraged them to do the same. Fitness is how it started for us and it is wonderful to see most of these adult children understand the significance and the role that exercise plays in our physical and mental health. We are all still active although we no longer meet on a daily basis for which we called our therapy runs (#runners code) but whenever we do meet we fall back into this rhythm that provides us with comfort and inspiration. This is what makes us Forever Friends! Happy Birthday Lynn!